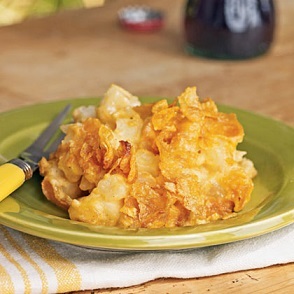 This restaurant recipe for Potato Casserole will satisfy appetites and taste buds for breakfast, lunch or as a dinner entree. 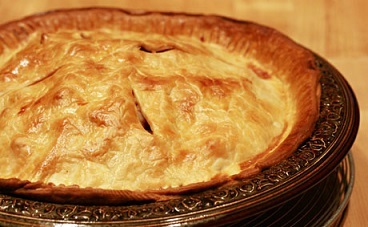 Serve it with fresh fruit or a salad or fresh vegetable platter and for a finale, delicious French Chocolate Pie! This potato pie is incredibly tasty. I guess I love most food in a pie crust, but this Potato Casserole will amaze you. A perfect marriage of flavors happens when onions, cheddar cheese and potatoes are combined with the wonderful looking and tasting crust and makes you want to cut into the pie immediately. Preparation time: 1 hour. 4-6 servings depending on portion desired. Put the bottom unbaked pie crust into 9 inch pie pan (baking pans) and tip the cheese and onion mixture into the pie crust. 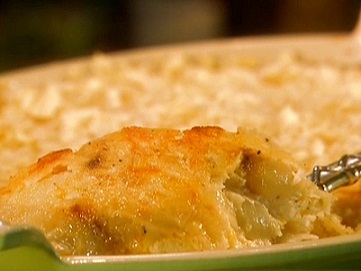 Enjoy this favorite restaurant recipe for Potato Casserole and the company of those your share it with!